It's Prototype presentation day. Everyone is nervous. Arizona's patients, the lesbian couple who had a baby, gave her a tin of cookies as a thank you. 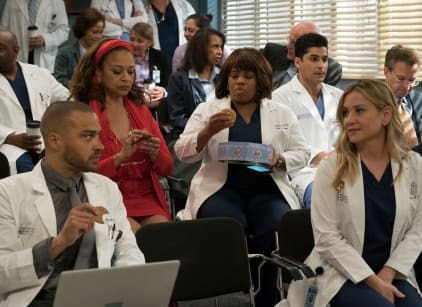 Arizona offers the cookies up and shares them with many of her colleagues. She gets a page from the couple and they tell her that they accidentally used peanut butter cannabis in the cookies. Arizona sneaks back into the presentation during Richard's presentation and tells Meredith and Jo what happened. By then, the tin of cookies has made it to the judge's table. Just as they're trying to figure out how to confiscate them, Catherine is having a hot flash while giving her presentation, Jackson is rambling about vaginas, and April is laughing uncontrollably. Catherine tells Jackson that the lawsuit with Froy was a sexual harassment one. Apparently, there are thirteen cases of sexual harassment involving Harper Avery and he was a serial sexual predator. Owen calls Amelia freaking out because they're dropping off a baby for him to foster and it's an infant. He wants her to come over to help him. Amelia is going to give Alex a heads up that she's leaving, but she finds out that he had the cookies too. Maggie wanders out of the lecture hall where the others are. Arizona goes looking for her and so does Andrew who is completely spaced out and enthralled by paintings on the wall. They find out that Miranda had a cookie too. Meredith tells her that she'll take over her surgery, but when Bailey leaves she accidentally closes the door on Meredith's hand injuring her. Roy doesn't tell anyone that he ingested a cookie. Amelia brings Alex to Owen's house. Owen is annoyed that she brought him. They try to get him to stay in the back, but he's front and center when the DHS woman arrives with the baby and offers to give the baby a checkup. Jackson and Catherine discuss Harper Avery's past misconduct and Jackson figures out that his mother is the one who paid the women off and covered the whole thing up. Arizona talks to Maggie (who is too busy talking about cheese) about Carina. She thinks she moved too fast with her, and she feels like she made Carina stay in the country instead of going back to Italy. Andrew daydreams about Sam. April tells Miranda that she overhead something bad, but she doesn't share what it is. Meredith talks Jo through the surgery that Miranda was performing because she can't do it with her injured hand. Roy freaks out when he's supposed to help a patient and somehow stabs himself with a scalpel. Richard is finally told what is going on and why all the surgeries have been cancelled and the presentations postponed. April and Miranda tell Meredith about Harper Avery. She confronts the Averys. She pieces together that Marie was one of the women and that's why Ellis took her name off of their project. They hope to get ahead of the scandal, but news broke out and the secret is out now. Jo's surgery is a success.